Yale College, one of the oldest and largest of American colleges, situated in New Haven, Conn. The design of founding a college in New Haven was formed by the planters soon after the settlement of the town, but in 1652 it was voted to be " too great a charge for us of this jurisdiction to undergo alone." It was agreed, however, that if the Connecticut colony would assist, New Haven would bear its just proportion of the expense of erecting and maintaining a college in that town. But in consequence of remonstrances from the people of Massachusetts, who argued that the whole population of the colonies was scarcely sufficient to support one such institution, and that the establishment of a second would result in the sacrifice of both, the project was abandoned for the time, and the colony continued to make its annual appropriation to the support of Harvard college. In 1698 it was renewed, and a proposition was made to found a " school of the church," to be supported by contributions from the several Congregational churches. In 1699 ten of the principal clergymen were nominated as trustees to found a college. These held a meeting for organization at New Haven in 1700, and formed a society to consist of eleven ministers including a rector. They soon after met again in Branford, when each presented several books for the library, saying as he made the gift: "I give these books for founding a college in Connecticut." The general assembly granted a charter on Oct. 9,1701, for a " collegiate school in his majesty's colony of Connecticut," and on Nov. 11 the trustees met at Saybrook, which town they selected as the "most convenient place at present" for the college, and elected the Rev. Abraham Pierson of Killingworth as rector. The first student was Jacob Hemingway, who continued alone under the instruction of the rector from March to September, 1702, when the number of students was increased to eight, and a tutor was chosen. The first commencement was held on Sept. 13, 1702, at which four graduates of Harvard and one privately educated person received the degree of A. M. Rector Pierson, who never removed his residence to Saybropk, died in 1707, and the Rev. Samuel Andrew of Milford was appointed rector pro tempore. After this the senior class recited to him at Milford, while the lower classes remained at Saybrook in charge of two tutors. In the diplomas given at Saybrook the college is styled gymnasium academicum. Complaint having been made of the inconvenience of the site, the trustees voted in 1716 to establish the college permanently at New Haven, and soon after the first building was begun. This was finished in 1718, and at the first commencement in New Haven, held on Sept. 12 of that year, it was named Yale college in honor of Elihu Yale, who had begun a short time before to make his donations. The name was at first confined to this building, but in 1745, when a new charter was granted to the college, it was applied authoritatively to the whole institution. In 1748 the laws of the college, founded partly upon those of Harvard and partly upon the Oxford statutes, were printed in Latin; and this was the first book printed in New Haven. It was published first in English in 1772. At Say brook the course of study had been limited to Latin, Greek, Hebrew, logic, metaphysics, theology, and physics; but after the removal to New Haven the curriculum was enlarged, especially in mathematics. Up to 1755 the instruction was given entirely by the rector and tutors, but in that year a professor of divinity was chosen. A chair of mathematics, natural philosophy, and astronomy was established in 1770; and in 1802 was founded a professorship of chemistry, mineralogy, and geology, and in 1805 one of Hebrew, Greek, and Latin. Since then the corps of instructors has gradually increased, until now (1876) the college has in its several departments nearly 100 professors and assistants. The other faculties, as now constituted,' were organized as follows: medicine, 1812; theology, 1822; law, 1824; philosophy, 1847. The government of the college was administered by the president and 10 fellows, all of whom were clergymen, till 1792, when, in consideration of certain grants from the state, the corporation voted that the governor, lieutenant governor, and six senior assistants in the council (called senators under the constitution) should become fellows, thus making the corporation to consist of 18 members besides the president. In 1871-'2 the legislature passed an act providing for the substitution of six graduates of the college as members of the corporation in place of the six senior senators. These six fellows, to be elected by the alumni, were so divided that one vacancy in their number should occur each year; and this annual vacancy is now filled by the election of a graduate to serve for six years. The principal buildings of Yale college occupy a square of about nine acres, N. W. of the public green. The main academical buildings are the " old brick row," fronting on College street, consisting of South college (built in 1794), the Athenasum (1763), South Middle college (1752), the lyceum (1803), North Middle college (1803), the chapel (1824), and North college (1821). 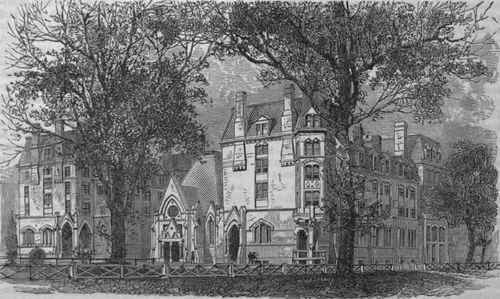 Divinity college (1836) was demolished in 1870 to make room for Durfee hall. Behind the principal row are the laboratory (1782), the college cabinet (1819), and the old Trumbull gallery, erected in 1832 for the collection of pictures left to the college by Col. John Trumbull, which were removed to the art building in 1868. On the W. side of the square is the library (1844), a fine Gothic structure of Portland sandstone. On the N. corner is Alumni hall (1853), used for the annual examinations and graduates1 meetings. The school of fine arts (1866), the most elaborate of all the buildings, occupies the W. corner of the square. It cost more than $175,000, and was presented to the college by Augustus Russell Street. Near it is the bronze statue of Rector Pierson, by Launt Thompson, erected in 1874. On the E. corner of the quadrangle is the new chapel (1875), a cruciform building of New Jersey sandstone, with a rounded apse at the E. end of the nave. It will seat 1,050 persons. This and the dormitories named Farnam and Durfee halls, which adjoin it, constitute a part of the new structures intended to surround the quadrangle. 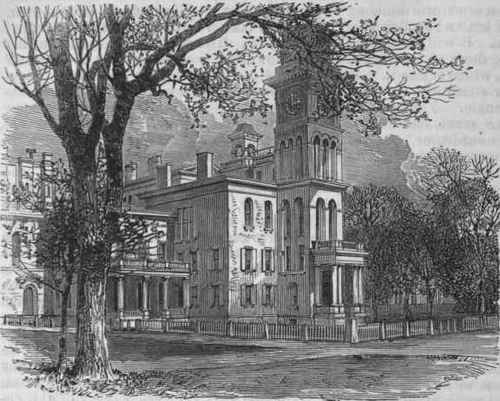 Farnam hall (1870) is of brick and blue stone, and Durfee hall (1871) of New Jersey sandstone. 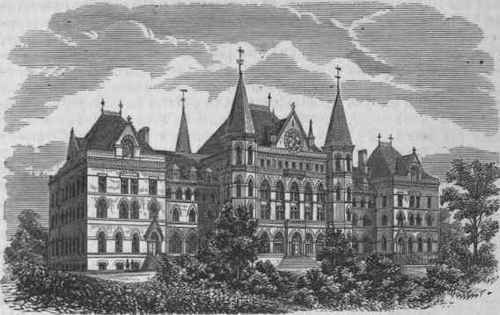 Of the buildings off the main square, the new divinity colleges, called East (1870) and West (1874) Divinity halls, furnish, besides class rooms, apartments for 150 students. 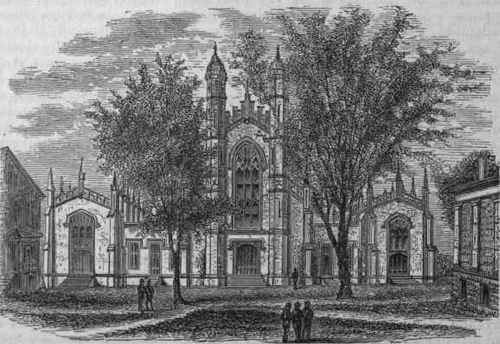 The Marquand chapel (1870), connected with the East hall, will seat 250 persons. The buildings of the Sheffield scientific school, called respectively Sheffield and North Sheffield hall, and of the medical school, are conveniently situated and well adapted for their purposes. The law school occupies the entire third story of the county court house. - The departments of instruction are comprehended, under four divisions or faculties, as follows: philosophy and the arts, theology, law, and medicine. Under the first are included the undergraduate academical department, the undergraduate section of the Sheffield scientific school, the courses for graduate instruction in both of these departments, and the school of the fine arts. Applicants for admission to the undergraduate academical department must be at least 16 years of age, and are required to pass an examination in Latin grammar, Sallust, Cicero, Virgil, and Latin prose composition; Greek grammar, Xenophon, Homer, and Greek history; higher arithmetic, algebra, and the first two books of Euclid; English grammar and geography; and the elements of the French or German language. The course of instruction occupies four years. Each year is divided into three terms: the first term begins 11 weeks from commencement, which is held on the Thursday after the last Wednesday in June, and continues 14 weeks; the second begins on the first Thursday in January and continues 13 weeks; and the third begins 10 weeks before commencement. The faculty of this department consists of professors of moral philosophy and metaphysics, of natural philosophy and astronomy, of geology and mineralogy, of Latin, of mathematics, of Greek, of rhetoric and English literature, of history, of chemistry and molecular physics, of modern languages, of German, and of political and social science; three assistant professors, in mathematics, Latin, and English literature; and two tutors. Instruction is partly by text books and partly by lectures. Public examinations are held at the close of the first and second terms, and at the close of the year on all the studies of the year. The annual charge for tuition, room rent, and incidentals is $140. The necessary annual expenses for board and instruction are from $375 to $650. Provision is made for the education without charge of about 100 indigent students, and there are 24 scholarships, yielding $60 to $100 a year, which are bestowed on deserving students of small means. The academical department has two fellowships, the Douglas and the soldiers' memorial, each having an income of about $600, which are bestowed upon recent graduates who shall reside in New Haven pursuing non-professional studies. The first may not be held more than three years by any one incumbent, and the second not more than five years. The Berkeley, Clark, Bristed, and Woolsey scholarships, yielding from $46 to $120 a year, and many prizes, from $10 to $250 a year, are given to successful students. The degree of bachelor of arts is conferred on those who have completed the course, and the degree of master of arts on bachelors of arts of two years' standing, who give evidence on examination, after one year's non-professional study in New Haven, of having made further satisfactory progress in liberal studies, or on bachelors of arts of three years' standing who may prosecute their studies elsewhere, and may give evidence by their printed writings or on examination that they are worthy of the degree. The course for graduate instruction in this department embraces three groups of studies. The first group comprises political science, history, philosophy, and English literature; the second, philology, including instruction in Sanskrit, Hebrew, and the other Semitic languages, the elements of the Chinese and Japanese languages, Anglo-Saxon and the early forms of English, old French and Provencal, the older Germanic languages and literature, the American Indian languages, and in special Latin and Greek authors; the third, the mathematical and physical sciences. The terms correspond with those of the undergraduate department, and the course of study occupies two years. The fees are from $100 to $150 a year. The degree of doctor of philosophy is conferred on those who have fulfilled the requirements of the course. - The Sheffield scientific school, which is partly analogous to the academical department and partly to the professional schools, was founded in 1847, but did not take its present name till 1860, when it was reorganized and placed upon a firm foundation through the munificence of Joseph E. Sheffield of New Haven, whose gifts to the school have exceeded $350,000. In 1864 it received the avails ($135,000) of the national land grant of 1862, and thus became the college of agriculture and mechanic arts for Connecticut. The faculty consists of 16 professors and 13 instructors and assistants. Candidates for admission must be not less than 16 years of age, and must pass an examination in English grammar, history of the United States, geography, Latin, arithmetic, algebra, plane trigonometry, and elementary natural philosophy. The course of instruction occupies three years. The first year's study is the same for all, and comprises German, English language and composition, mathematics, physics, chemistry, drawing, physical geography, botany, and political economy. During the last two years the instruction is arranged in special courses, to suit the requirements of different classes of students, as follows: 1, chemistry; 2, civil engineering; 3, dynamic engineering; 4, agriculture; 5, natural history; 6, studies preparatory to a medical course; 7, studies preparatory to mining and metallurgy; 8, select studies preparatory to other higher studies. Lectures on military science and tactics are also given. The terms correspond with those of the academical department. The degree of bachelor of philosophy is conferred on graduates, and those of civil and dynamic engineer on bachelors who pursue a further course of two years' study. The degree of doctor of philosophy is. also open to those who pursue a less practical graduate course under conditions similar to those required in the graduate academical course. The graduate courses of the scientific school are more particularly designed for special professional training in the physical sciences and their applications. The charge for tuition in the undergraduate department is $150 a year; in the special course in chemistry there is an additional charge of $70 for chemicals and use of apparatus; and there are also several minor charges. - The school of fine arts affords thorough technical instruction in drawing and painting, together with a knowledge of the history and criticism of art by lectures. It is designed to embrace a similar course in architecture, sculpture, and anatomy, but those chairs are not yet filled. The present faculty consists of professors of painting, of the history of art, and of drawing, and an instructor in perspective. The collections embrace the Jarves gallery of Italian art, consisting of 120 paintings of the Italian school dating from the 11th to the 17th century; the Trumbull gallery of 54 pictures, comprising most of the originals of Trumbull's pictures of the revolution; a collection of about 75 pieces of contemporaneous art; and many casts from the antique. The terms for instruction are $36 a quarter. The school is open to both sexes, but none are admitted who are less than 15 years of age. - The faculty of the department of theology consists of a lecturer on church polity and American church history, and professors of systematic theology, of Hebrew literature and Biblical theology, of homiletics and the pastoral charge, of ecclesiastical history, and of sacred literature. The course of instruction occupies three years, called respectively the junior, middle, and senior year. There is but one term in each year, beginning on the second Thursday in September and ending on the second Thursday in May. Students are licensed to preach after the second year. All members who pass the prescribed examination at the end of the senior year, and present an approved thesis on some topic in theology, receive the degree of bachelor of divinity. The reference library of the seminary contains 2,000 volumes; the Lowell Mason library of church music, one of the largest in the country, is also in the seminary. No charge is made for instruction, room rent, or use of library, and indigent students receive $100 a year from the income of scholarships and other funds. In special cases additional aid is given. There are 18 scholarships belonging to the seminary. - The faculty of the law school consists of professors of mercantile law and evidence, of elementary and criminal law and the law of real property, of constitutional law, contracts, and wills, and of pleading and equity jurisprudence. The course of study includes also lectures on life insurance, international law, ecclesiastical law, forensic composition, English constitutional law and history, medical jurisprudence, forensic elocution, Eoman law, and patent law. There are two ternrs in each year, a fall term beginning with the first academical term and ending the day before Christmas, and a spring term beginning on the second Wednesday of February and ending at commencement. The students are divided into two classes, senior and junior, each of which has a special course of study. A course is also provided for those who desire to study law with reference to commercial pursuits. The library contains 7,000 volumes, and a fund is provided to furnish all the current reports and legal periodicals. The degree of LL. B. is conferred, after examination, on attorneys at law who have studied two terms in the department, on bachelors of arts, science, or philosophy, who have studied three terms, and on other students who have studied four terms. 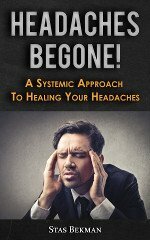 The fees are $90 for the annual session, and $5 for a diploma. - The faculty of the medical department consists of professors of chemistry and toxicology, of obstetrics and the diseases of women and children, of materia medica and therapeutics, of histology, pathology, and microscopy, of the theory and practice of medicine, of surgery, of general and special anatomy and physiology, and a lecturer on insanity. The course is divided into two terms in each year, a winter term beginning on the second Thursday in October and ending on the second Thursday in February, and a spring term beginning on the first Thursday in March and ending at commencement. The first year is devoted to elementary and the second to practical branches. Provision is made fo»a third year's study, to review the studies of the course, with the addition of advanced courses of reading. A surgical clinic is held every Wednesday at 12 M., and a medical clinic every Friday at 3 P. M. The museum contains a large collection of natural and morbid specimens, as well as casts, models, and plates. The degree of M. D. is conferred, on satisfactory examination, upon candidates 21 years of age, who have studied medicine for two years if graduates of a college, and three years if not graduates. The matriculation fee is $5; winter term fee, $105; spring term fee, $60; laboratory fee, $10; demonstrator's ticket, paid by those who dissect, $5; and graduation fee, $25. - The library, originally founded with 40 volumes, soon received valuable gifts of books from Sir John Davie of Groton, Jeremiah Dummer, colonial agent in London, in behalf of himself and others, Elihu Yale, and Francis Nicholson. In December, 1718, it was removed to New Haven, when 250 volumes were lost in consequence of the violent opposition of the people of Saybrook to its transfer. The most valuable gift of the last century was that of Bishop Berkeley, who in 1730 sent it 1,000 volumes. In 1800 it contained about 3,500 volumes, in 1830 about 10,000, and in 1860 about 45,000; it now (1876) comprises 76,000 volumes. Besides the college library proper, there are the libraries of the professional schools, which contain in the aggregate 17,000 volumes, and the consolidated Linonian and Brothers society library of 19,000 volumes; total of university libraries, exclusive of pamphlets, 112,000 volumes. The museum of natural history, endowed in 1866 with $150,000 by George Peabody, has now become an important adjunct of the college. A fire-proof building has been erected on the square W. of the college square, and in it will soon be arranged the geological and mineralogical cabinet, and the specimens illustrative of zoology, paleontology, and American archaeology. These collections have been largely increased during the past few years by the annual expeditions to the west led by Prof. Marsh, and by the explorations on the coast under Prof. Verrill. The present building will be but one wing of a much larger structure. - Yale college has received but little aid from the state, and has depended mostly on the revenue derived from students and the gifts of individuals. According to the treasurer's report for the year ending April 30, 1875, the total invested fund of the college amounted to about $1,550,000; the total income for the same year was $235,465, of which $107,000 was derived from term bills of students. No estimate is given of the value of grounds, buildings, libraries, collections, apparatus, etc. Previous to 1875 the college had conferred 10,605 degrees, of which 870 were honorary. In 1875-6 the number of pupils in each department, according to the annual catalogue, was as follows: undergraduate academical students, 582; Sheffield school, 224; graduate and special students, 63; theological department, 99; law department, 76; medical department, 42; total, 1,086; deduct for names inserted twice, 35; total number of students in the college, 1,051. The "Yale Literary Magazine," a monthly periodical,, begun in 1838, and two weekly newspapers, begun in 1855 and 1872 respectively, are published by the students. East and West Divinity Colleges and Marquand Chapel.